It seems we managed to impress a few folks, or at the very least not upset anyone too horribly, with our display and demo efforts at Adepticon last year. 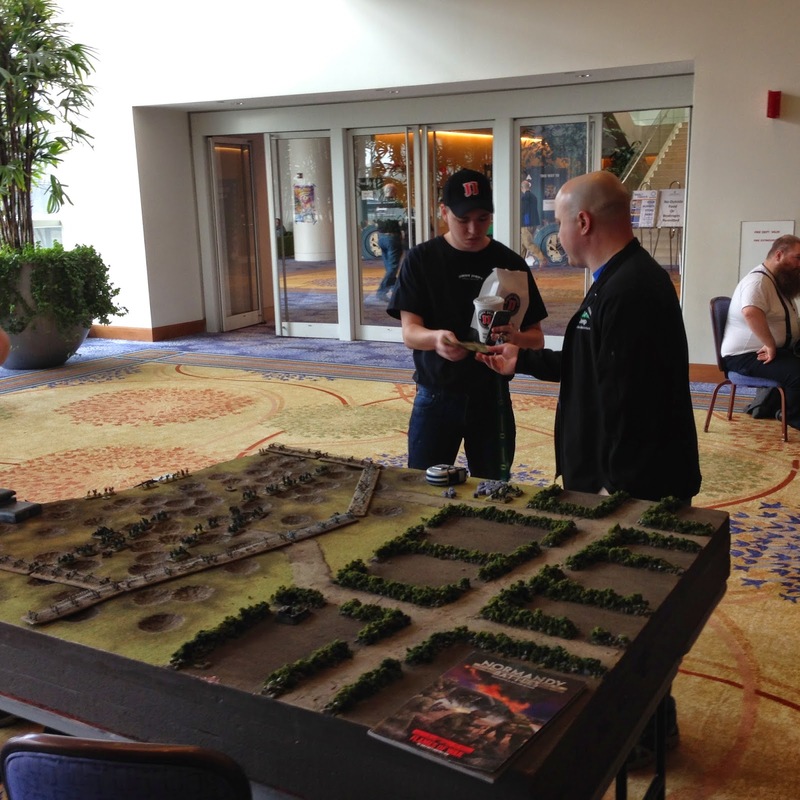 I'm basing this assumption on the fact that the folks at Battlefront asked us out again this past weekend for another go at Ranger Demos and a Flames of War display at Adepticon 2015. Initially, we'd all intended to play in this year’s Mid War Nationals. However, running demos and setting out some of our toys at a big con like Adepticon was too tempting to pass up. We drew lots: Lee, Ryan, and Ken went to play in the tournament. Rick, Erik, and Mark would man the demo table. 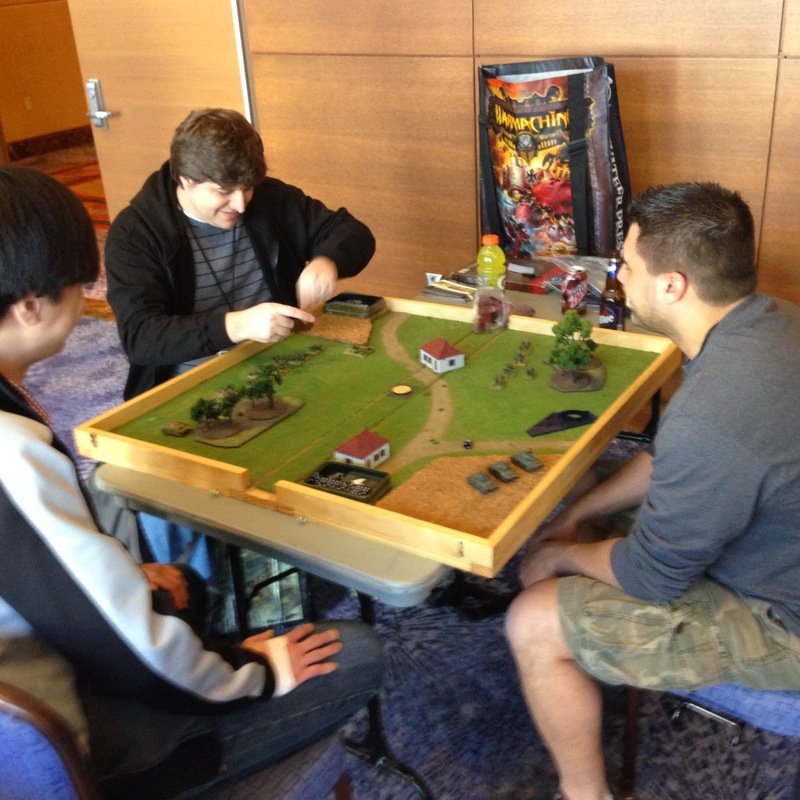 Mark introduces two complete strangers over a game of Flames of War on our portable demo table. The only thing cooler than a portable demo table? The portable Old Fashioned fixings our friend Josh from Oshkosh brought around on Thursday night. Thanks for the drink Josh! 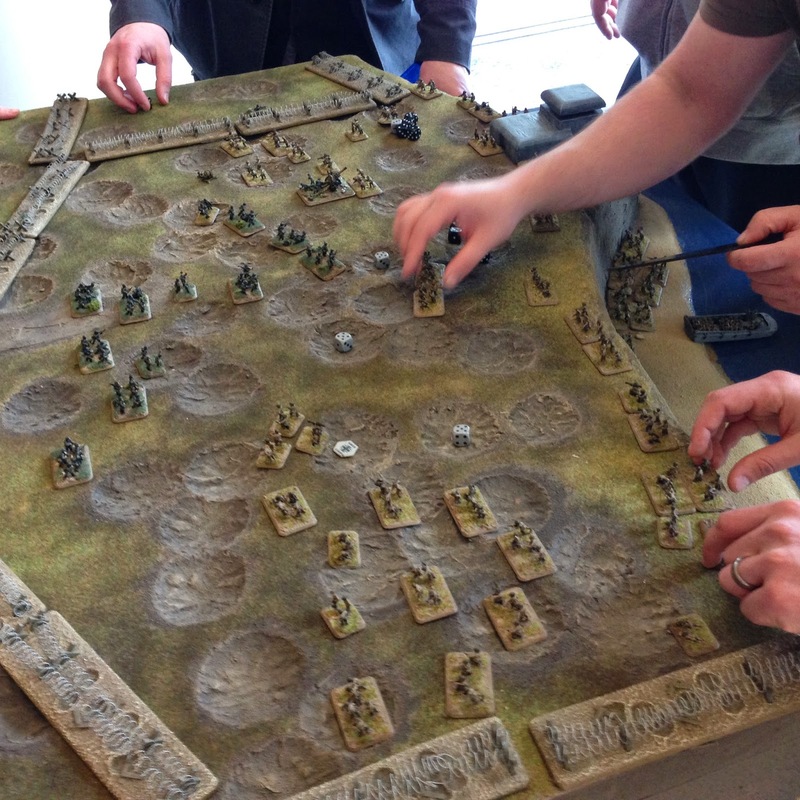 Last year, we brought along our Easy Green board hoping to drum up some excitement for our Operation Overlord event. 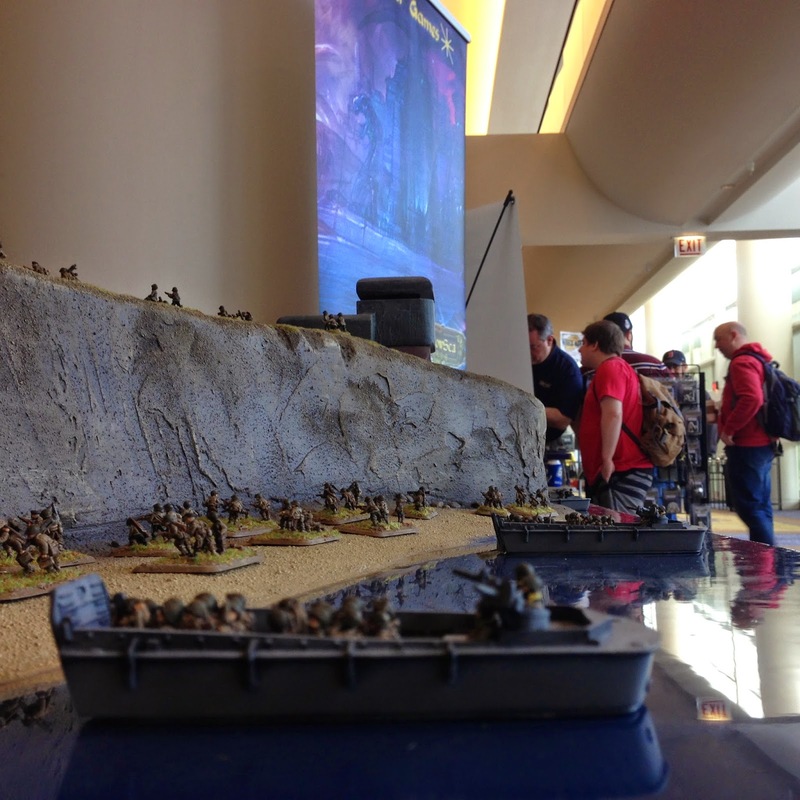 Rather than drag out the same display, we decided to bring along Pointe du Hoc this go round. This decision required a little extra effort; the Pointe du Hoc board is an absolute monster. Seriously, this thing has its own bed in an unused bedroom at one of the Battle Badgers’ house; all of the foam on top of the thing makes stacking it against the wall with others a little troubling. I’m happy we did it, however, as it really lends itself to some fantastic scenario play for a crowd of people. Our Pointe du Hoc board, we're hoping to bring this thing along to both the Midwest Gaming Classic, and Little Wars next month. Our adventure began nice and early Thursday morning. We arrived just before 7 and spent the morning staking a claim on a table in the hall just outside the main entrance, saying ‘hi’ to a couple of old friends, and checking out the con. Thursday afternoon had us setting up Pointe du Hoc, and our demo board, and playing a few games and answering questions for the folks who stopped to take a look at our cliff. We also managed to hand off a box full of door prizes to Lance from the Midwest Gaming Classic that Battlefront had sent to him care of the Battle Badgers. 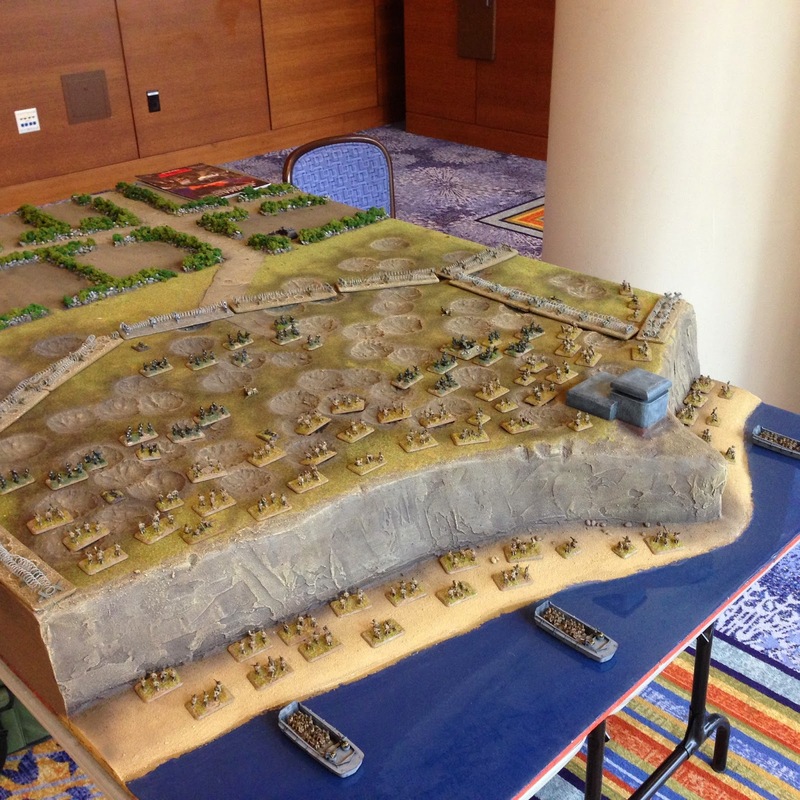 By the way, if you're in the Wisconsin area and want to come take a peek or play through the Pointe du Hoc scenario, we will be running demos at the Midwest Gaming Classic this year on Saturday April 11th (drop us a line and let us know to expect you). With our table claimed, our truck unloaded, a few demos played, and our bellies empty, Thursday night found us at Lou Malnati’s for some of that Chicago deep dish everyone is always talking about. The only disappointment was the inability of any Badger to eat more than a single slice. 4 friends from New York stop by, each take charge of a company of Rangers and set out to silence the German battery of 155's punishing the landings on other beaches. 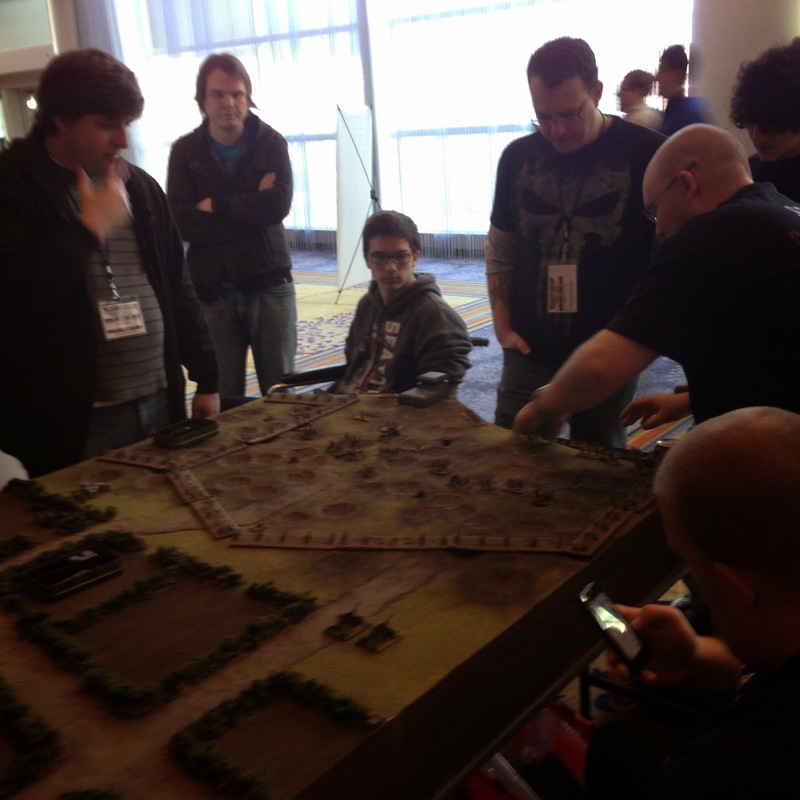 A crowd of 7 give us a hand playing through 1 of the 5 Pointe du Hoc games we played this weekend. The fella on the left with the pensive look and his hand on his chin did a fantastic job of mowing down all of his mates the second they reached the top of the cliff. We saw 2 Ranger victories this weekend, but this particular game was NOT one of them. After dinner on Thursday, the couple of Battle Badgers who were only able to swing one day of vacation for the weekend showed up. Their arrival was both celebrated and booed as they brought booze and models that needed to be painted for tomorrow’s tournament. With only one thing to do, (well…two I suppose if you count the booze), we grabbed a table in the lobby and went to work finishing off the three armies being played in the tournament. 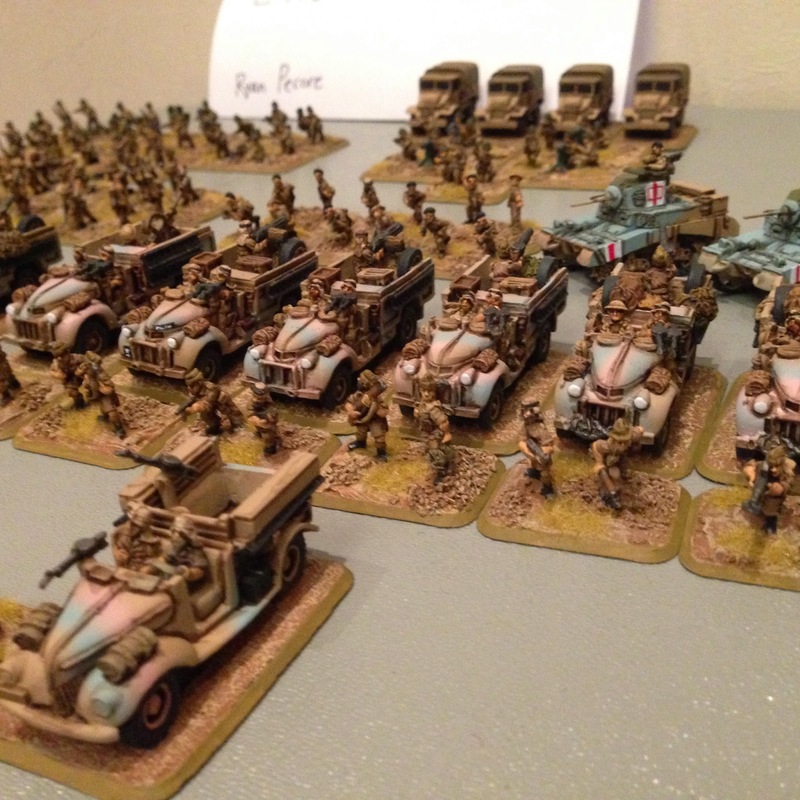 It’s important to note, however, that while the club helped out with Lee’s Armored Rifles, Ken’s brush was the only one to touch his Brandenburgers, and Ryan was similarly the sole painter of his LRDG. As both Ken and Ryan had their eye on the weekend’s best painted trophy, I thought this was important to mention. I can't quite recall when, but at some ungodly hour of the morning we finished up and racked out to get a bit of sleep before kicking off Friday. Why stop playing for lunch? Jimmy John's delivers to Pointe du Hoc! Friday morning brought on a drastic need for coffee. A few cups provided by Mark, and the Starbucks downstairs, got us all moving. We ran demos from 8:30 in the morning until dinner around 7 in the evening. We didn't bother to stop for lunch, and neither did the fellas playing through our scenario. As it turned out, Jimmy John’s was willing to deliver to Pointe du Hoc. We ran into the guys from the Dice Dojo and talked a bit about a series of Flames of War campaigns they are looking to kick off in the next few weeks. We'll post more details when we get them, but thus far we've all agreed to get down there and play a couple of times this summer. Friday was a busy day for demos: through the course of the day we played through our little demo game 28 times. Sometimes one of us Badgers would have to play a side, others we'd teach from the side of the board while two mates went at it. 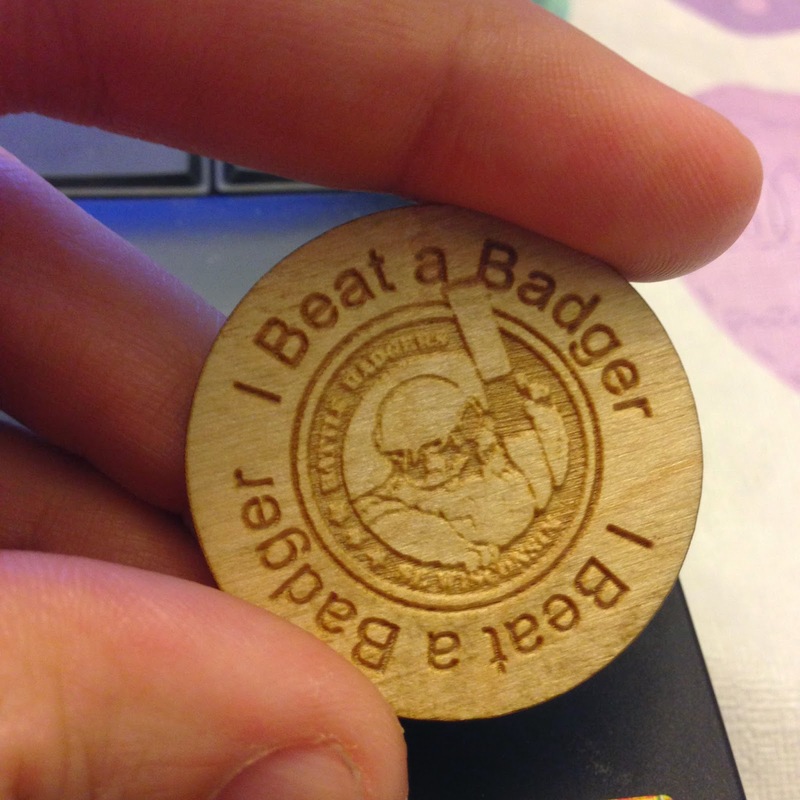 Each of those 28 demos ended with our players getting a little wooden ‘I Beat a Badger’ token. Tails! 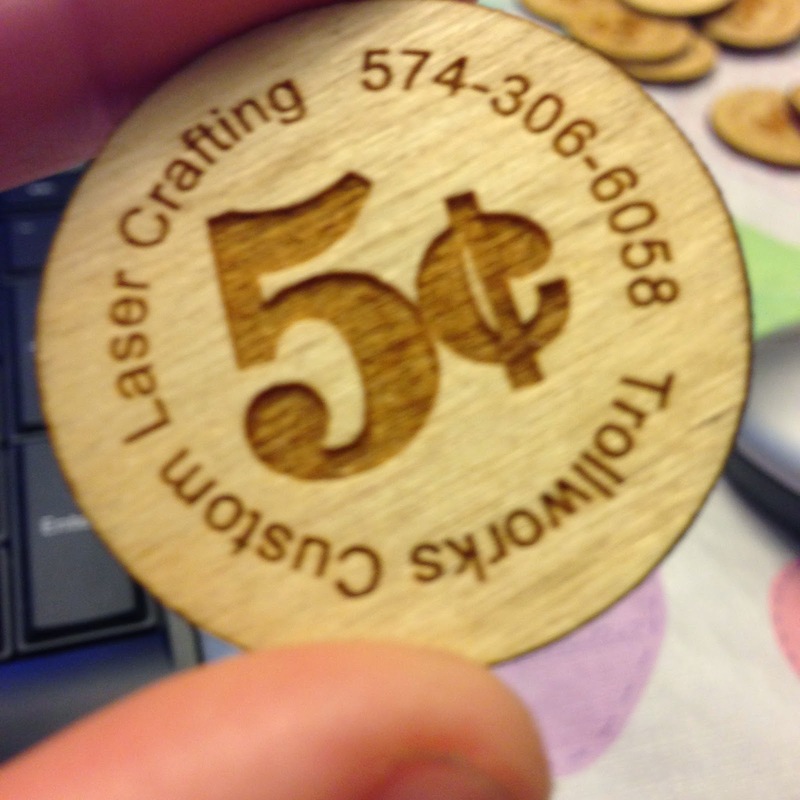 These tokens were made by our friend Lee at Trollworks. He does all of our tokens and trophies. You may have seen a few of his dice towers on the Flames of War facebook group recently as well. We'd worked out a little agreement with Battlefront beforehand: anyone who presented our token at the Battlefront booth would be given a prize of some sort or another. We had no idea what this little prize was going to be, so when our first demo players, a younger teen and his father, came racing back to show us the plastic Sherman V kit and paint set he'd been given we were almost as excited as he was. This little deal ran on through most of Saturday, until supplies ran out. My opinion is a little biased, but this seemed incredibly generous on Battlefront’s part. A set of paints and a plastic Sherman trumped anything that the poor folks who didn't pre-register got in their Adepticon swag bags. Here’s hoping we managed to create a couple more Flames of War players. Saturday was much like Friday, with more demos and a little more excitement in the tournament hall. Y'see, after Friday's results the Battle Badgers weren't too likely the victor. However, the fellas still had their eyes on the Best Painted trophy, and for good reason. Ken's Brandenburgers. Check out the flag conversion on the front of that truck: ropes and everything! Ryan's LRDG. Hey wait a minute... are those things pink and blue? Yup, and it's historically accurate! 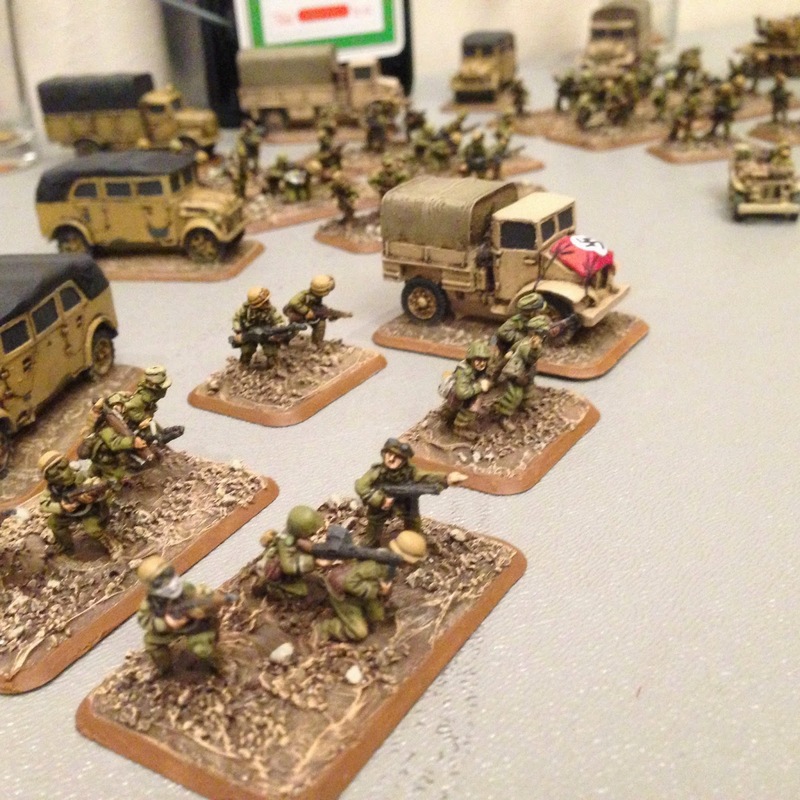 I snapped these pictures quickly with a shaky iPhone; these images don't do either of these armies justice. However, I'm sure you'll be able to see both of them in a much better light on the Flames of War page very soon, as Ryan's LRDG did in fact get to take home the Best painted trophy, with Ken's Brandenburgers a close second. I'm still trying to talk the both of them into doing a little post here on the blog better detailing these beautiful models. After we packed up the toys on Saturday night we grabbed a bite at Big Bowl, played a few games with some new friends, checked out the swap meet, and forgot to go to bed. Sunday morning had us packing up and heading home, but before we got out the door, John from Battlefront insisted we swing past the booth. There he had us each pick out a box of new toys for our efforts over the weekend. I picked up this sweet little number. 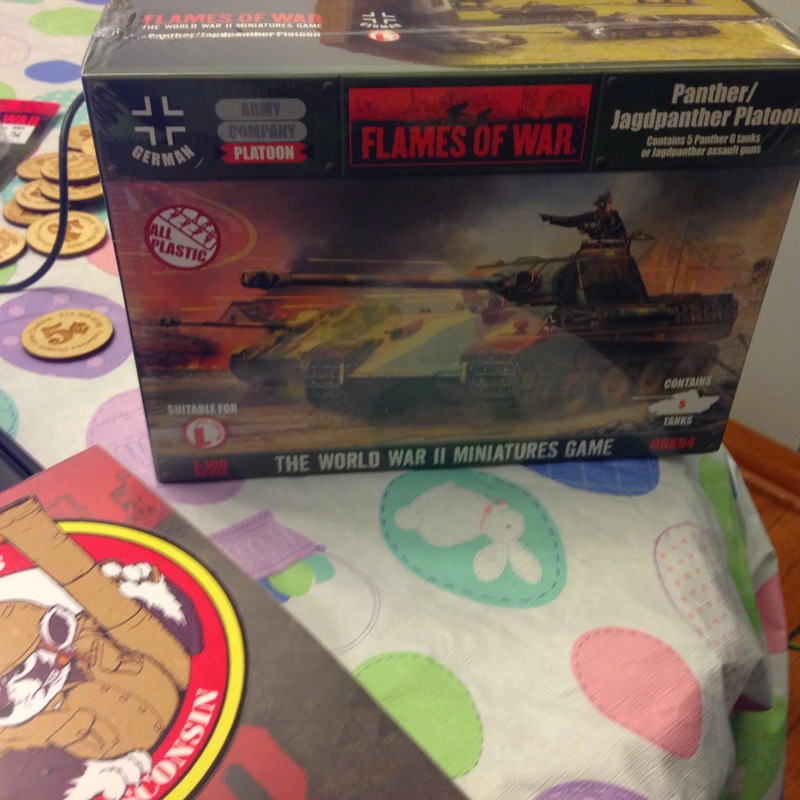 New plastic panthers! I'll crack this open and post a review shortly! Thanks again John, and thanks to everyone at Battlefront for having us out for the weekend. We ran 68 demos and had a blast doing it!